There is an interesting debate on twitter about the use of language. Campaigners and psychiatrists have been arguing over the tone of the debate which has been mostly centered on the word ‘Pharma-Whore’. It seems that this is merely a charade however to distract from the many ethical problems plaguing psychiatry. Psychiatrists don’t want to face the fact that their profession is riddled with conflicts of interest so they are trying to center the debate on language instead. “you are either abstinent or promiscuous when it comes to industry. Well you can see which side I am on”. .
What word would you use to describe such audacious promiscuity to industry? But Of Course They Would..
“…European drug regulatory bodies and GlaxoSmithKline have quickly rallied their rebuttals to a BMJ report that questioned the safety profile of GSK’s now-unavailable pandemic flu vaccine Pandemrix, as well as the lack of transparency over drug information. In a report based on GSK-made internal safety reports, The BMJ found that during the 2009-2010 H1N1 flu pandemic, GSK had received 5,069 serious adverse event reports for Pandemrix in about six months. It represents a rate of 72 cases per million doses—seven times the rate for two other GSK pandemic flu vaccines combined. The report also criticized the drugmaker and health authorities for not making the information public. GSK’s Pandemrix vaccine: why was the public not told of early warning signs? Because we’re all just Glaxo’s guinea pigs aren’t we? In an interview with The BMJ, Liam Donaldson, England’s chief medical officer at the time, recalled the situation around the October 2009 roll-out: “The UK had worked for several years on its pandemic influenza plans, as part of a globally coordinated approach. This included, well in advance, establishing the process for developing and introducing a vaccine in such a public health emergency. “Faced with an emerging pandemic of unknown severity, the process was initiated. The national scientific committee for vaccines (the JCVI) and the statutory medicines regulatory authorities were fully engaged in the procedural steps that led to the introduction and use of the vaccine. This was not a policy decision taken in the absence of such expertise,” he said. Vaccines against influenza are arguably the only vaccines that a notable portion of healthcare professionals decline despite recommendations.6 And in late 2009, vaccines against the H1N1 swine flu—which was turning out to be a far milder pandemic than officials had predicted—were even more controversial than normal. Now, eight years after the outbreak, new information is emerging from one of the lawsuits that, months before the narcolepsy cases were reported, the manufacturer and public health officials were aware of other serious adverse events logged in relation to Pandemrix. In documents obtained through the pretrial discovery process (see supplementary data on bmj.com), prosecutors suing the Irish Minister of Health, Health Service Executive, Health Products Regulatory Authority, and GSK have found a string of GSK postmarketing safety reports that show a striking difference in the number and frequency of adverse events reported for three GSK pandemic vaccines approved and used across the world: Pandemrix, Arepanrix, a similar H1N1 vaccine that also contained AS03 adjuvant, and an H1N1 vaccine without adjuvant (no brand name is given). The BMJ learnt of the reports from my colleague Tom Jefferson, a medically trained epidemiologist who was hired as an expert witness by the solicitors representing Aoife Bennett, an Irish woman who developed narcolepsy after vaccination with Pandemrix in 2009. Jefferson took on the case in 2015, and last year the lawyers received a copy of the GSK safety reports that had been emailed within the company and to at least one regulator (Ireland). Adverse event tables embedded in nine reports spanning the four months between December 2009 and March 2010 offer a glimpse into the vaccines’ safety profiles. “When I saw those tables, I just fell off the chair. A consumer can figure out what’s going on here,” Jefferson told me (table 1). Jefferson immediately calculated the adverse event rates for each vaccine, which showed large differences between Pandemrix and Arepanrix. Any real differences between the vaccines would be especially alarming because Pandemrix and Arepanrix are, broadly speaking, the same vaccine manufactured in different facilities and used in different countries. Divergent rates of adverse events might implicate a manufacturing problem. “The odds ratios, the point estimates, are all high. And some of them are significantly high—5.39 [95% confidence interval 3.70 to 7.85] for deaths [for Pandemrix v the other vaccines],” Jefferson said. “The thing that struck me was not just that the odds ratios were high, but the fact that nobody had tabulated and analysed them,” he said, pointing out that the GSK reports provided numerator and denominator data sufficient to calculate the odds ratios but did not actually contain those calculations. The BMJ conducted its own analysis of the adverse events, most of which seem to have been reported spontaneously to GSK (figs 1 and 2). 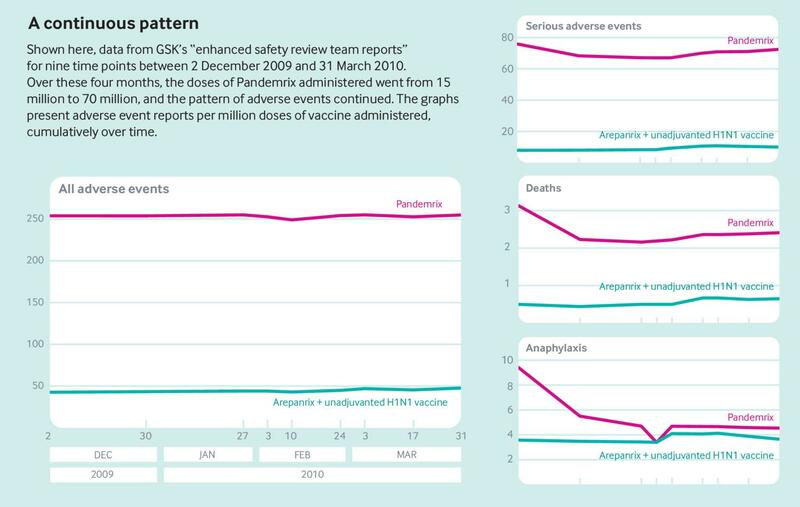 For a range of concerning adverse events, reports were coming in for Pandemrix at a consistently higher rate than for the other two GSK pandemic vaccines–four times the rate of facial palsy, eight times the rate of serious adverse events, nine times the rate of convulsions. Overall, Pandemrix had, proportionally, five times more adverse events reported than Arepanrix and the unadjuvanted vaccine. And the raw numbers of adverse events were not small. Although it is often said that perhaps only up to 10% of adverse events are reported to national reporting systems,16 by late November, GSK had received 1138 serious adverse event reports for Pandemrix—a rate of 76 per million doses administered. By mid-December, there had been 3280 serious adverse event reports (68/million doses). The last report seen by The BMJ, dated 31 March 2010, shows 5069 serious adverse events for Pandemrix (72/million doses), seven times the rate for Arepanrix and the unadjuvanted vaccine combined. But neither GSK nor the health authorities seem to have made the information public—nor is it clear that the disparity was investigated. This is in contrast to the reaction to narcolepsy, which quickly made news headlines and was the subject of a GSK press release and investigation17 in a matter of weeks after the first reports from Sweden and Finland. In many of the GSK reports, the company briefly mentions having conducted “safety reviews”—for example, with respect to anaphylaxis, facial palsy, and Guillain-Barré syndrome. The BMJ asked GSK for a copy of those reviews but it did not provide them. The BMJ asked GSK whether it ever undertook any investigations to understand the discrepancy in adverse event reporting between Pandemrix and Arepanrix, whether it notified healthcare providers about the discrepancies, whether it considered pulling Pandemrix from the market, or considered recommending Arepanrix or another company’s vaccine. But GSK declined to answer these and all of The BMJ’s questions, citing ongoing litigation. The BMJ asked the UK Department of Health why it recommended Pandemrix over Baxter’s Celvapan, but the department also declined to comment, calling the question “quite technical” and suggesting we submit a freedom of information request for an answer. Clare Daly, a member of the Irish parliament, called the adverse events after Pandemrix a “completely avoidable catastrophe,” and has been demanding answers for over a year.19 In the Irish National Assembly last year, she told the then prime minister, Enda Kenny, “The Health Service Executive (HSE) decided to purchase Pandemrix and continued to distribute it even after they knew it was dangerous and untested, and before most of the public in Ireland received it.”20 In response, the Taoiseach said that concerns about the safety of Pandemrix and actions by GSK deserve “immediate analysis.” The BMJ requested an update on the investigation from the Irish Department of Health but did not receive a direct answer. But, had it wanted to, did the agency have the data to conduct such an analysis? Despite the similarity between the two vaccines, Arepanrix was not authorised in the EU until March 2010, late in the pandemic, and data reporting requirements for the two vaccines differed. “While it might have been possible to estimate reporting rates based on usage data, which are difficult to obtain during a pandemic, EMA does not have a methodology to compare reporting rates between two products (note that the pandemic influenza pharmacovigilance updates included number of reports, not rates),” an EMA spokesperson said. Pandemrix and Arepanrix were designed for a pandemic and were removed from global markets after the pandemic. Whatever adverse events they may have caused, they are vaccines of the past. But the events of 2009-10 raise fundamental questions about the transparency of information. When do public health officials have a duty to warn the public over possible harms of vaccines detected through pharmacovigilance? How much detail should the public be provided with, who should provide it, and should the provision of such information be proactive or passive? If history were to repeat itself, does the public have a right to know? This article was amended on 21 September 2018 to correct the date in the legend to figure 1 from 2 October to 2 December. Competing interests: I have read and understood BMJ policy on declaration of interests and declare I am a colleague of Tom Jefferson, quoted in this story. Interesting comment by the ex-Seroxat user ‘Kiwi’ who made the notorious comment on my blog the other day about David Baldwin. It seems that the off the cuff comment made national news in the UK, quite astounding considering a lot of the scandals on my blog don’t make national news, but a random comment on an obscure (but maybe not so obscure now) blog post makes headlines news. The comment was insignificant, as was the phrase, however the (planted) sensationalist story certainly muddied the waters around the context and the content. The issue was about conflicts of interest, which are rife within psychiatry, and the drugs industry that funnels money into it, and has been for at least 50 years of the pharmacological mental illness treatment-age. This bias, and blatant unethical and immoral selling out of patients for a buck has cost people their lives. That is the real headline. Check out the comment below by the person that made the original comment; which of course the Royal college seized upon to throw a red herring into the media. I don’t buy it, and most people won’t. It’s a game to them. The whole psych-drug charade is a game to them. They care nothing for the harm it causes. The mental illness industry makes billions for Pharma and the doctors on their payroll make a nice littler earner too (some of the top dog psychs such as Key Opinion Leaders can make hundreds of thousands from industry). The people that suffer because of this are unsuspecting patients – because of lies from the Royal College of psychiatry and the playing down of side effects of psychiatric drugs. Conflicts of interest, fraud, and bias costs patients their lives. See the Zyprexa, Seroxat and Risperdal scandals for more on how all that happens. “Drugs advisor [David Baldwin] quits after being branded worse than Hitler [on Social media]”. Wow! Believe me this guy has done everyone a favour including himself. The truth hurts doesnt it! Im not as widely read on social media as some but i can think of only one person who blogged and labeled Baldwin ‘worse than Hitler’. That person being myself. And how flattered and thrilled i am to think i could have such influence to have triggerred his resignation. Brilliant. Several points have now been proven one being that when it comes to name calling and labelling of others these people can give it but they cant take it. Maybe Baldwin was forced to look in the mirror and reflect on the millions of people that have been harmed by him. The millions of seroxat victims who at this point in time are oblivious to the future plight that awaits (the traumatising withdrawal horror show that is relentless long lasting and brutal putting people in a position where death becomes a welcome relief and thousands by the way take this option and its not because they have a mental illness) should they try to get off the drug. Perhaps Baldwin and anyone else who disagrees with me who condemns my comments might like to try some seroxat for themselves. For no one knows a drug like the one who is taking it or has taken it or had to get off it. A person with an experience is never at the mercy of someone with an opinion. Heres the invitation take 40mg of paroxetine for 6 months then quit it. Dont worry about tapering [as ‘Not being given a tapering schedule is a minor issue’ response of a doctor]. Let me tell you something as for ‘withdrawal symptoms only lasting two weeks’ you may in fact have no withdrawal symptoms for several months (for they are often delayed) but then 3-4 months down the track BANG the withdrawal will hit like a train trash in the brain. You will suddenly become uncharacteristically weepy and tearful for no reason and then you will wish you had never been born. Im 8 years seroxat free and still recovering. I am still unable to work fulltime but im hoping one day i will return to fulltime employment. The withdrawal left me nonfunctioning human for over 6 years unemployed and unemployable. Never had any psych issues in my life it was all off label pill pushing. I would be the last person in the world to commit suicide but the withdrawal left me fightng for my life daily. Its a miracle im still alive. Thankfully i am and so will continue to state the truth. Perhaps Baldwin has now caught a glimpse of the truth and seen the horror he has caused (he should be deeply ashamed) and done the right thing. Maybe his conscience wasnt totally severed afterall! Do i stand by my W-T-H label. Yes you bet, because its the truth. Okay ..YOU take seroxat for ten years, get off it , then come back and comment? Till then you have no voice just an (ignorant) opinion. It appears the population of the UK is 63,186,000. Apparently about ten percent of people are taking these drugs. Thats a lot of people currently wearing striped pyjamas. Keep up the good work Truthman. I understand there has been something of a Kerfuffle in the media (see Peter Gordon’s addressing of it above) about a post I wrote a few weeks ago about conflicts on interest. Anyhow, I’d like to say, I would be willing to take the post down, if you (or perhaps your colleague- Wendy Burn) could tell me how much money you received from Pharma over your entire career- I’m talking close to exact amounts as possible. I’m sure you can at least make a guesstimate? has it been close to 10,000 pounds? more? 20,000? 100,000? 500,000? I think the public deserve to know. It’s 2018, and really this information should be public knowledge by now. I stand by my post, but I’d be willing to remove it as I think the information I am seeking would be far more important than the post. New Post From Seroxat Secrets On The Baldwin Kerfuffle..
What Really Killed Dolores O’ Riordain? “….IRISH rock star Dolores O’Riordan (46) drowned in the bathtub of her London hotel room while more than four times over the drink driving limit. The revelation came as a London coroner’s court held an inquest into the death of The Cranberries lead singer and mother of three. The death of Irish singer Dolores O’Riordain (from the Cranberries), is yet another celebrity demise that leaves us with more questions than answers. I’ve written about Dolores before (see here); in that post from 2014, I asked was Dolores on psychiatric drugs? As it turns out, according to the inquest into her death, she certainly was. She had four anti-depressants in her system at the time of her death (by drowning in a bath tub), and a high level of alcohol. Her death was recorded as accidental and alcohol was considered the culprit. She was also under the care of two psychiatrists; both quite well renowned. If, as the article suggests, Dolores was receiving the best psychiatric mental health care available, then why did she die? Surely, if you could afford the best health care, your life should be extended not diminished? that’s usually the way it works right? Not so, with psychiatric treatment. Pulitzer prize nominated journalist- Robert Whitaker’s ‘anatomy of an epidemic‘ explains in detail why those who receive psychiatric care (mostly in the form of drug treatments) have shortened life spans and increased disability and disablement. When someone gets diagnosed with a ‘mental illness’ – In Dolores’s case- Bi-Polar, it usually send them down a trajectory of psychiatric medication regimes, which can last for years, even decades. The multiple side effects from psychiatric drugs can end up being more of a problem than the original diagnosis. Often times the side effects can mimic psychiatric illnesses, leaving the person in a much worse state than if they weren’t on the drugs. It’s very hard to come off psychiatric drugs too, even if you want to, and due to their toxicity, many people are poor metabolizers of them anyhow, which means that the drugs build up in the liver, causing many physical and mental side effects to exacerbate over time. It’s interesting to note also, that 4 anti-depressants were found in Dolores’s system at the time of her death. Why on earth would her psychiatrists prescribe her 4 different anti-depressants? This is a recipe for disaster. It’s this kind of poly-pharmacy that often kills, maims or disables psychiatric drug users because of the various interactions between the medications. I took Seroxat for a few years in my twenties, and it was a horrific experience, it changed my personality, made me unruly, aggressive, act out of character etc (these are all common well known side effects of Seroxat and other SSRI anti-depressants) so I can only imagine what it feels like to be prescribed multiple psychiatric drugs. It seems Dolores’s story follows the same path as many of those who are prescribed psychiatric drugs over a long period of time. Usually the psychiatric diagnoses comes from a trauma. In Dolores’s case, she was sexually abused in childhood, and she became anorexic, it’s unclear when she was diagnosed with bi-polar, but it seems it was in young adult-hood or thereabouts. It’s safe to assume that she had been medicated for years because of this diagnosis. Once entered into this system of drugging it’s very difficult to get out of it, a lot of the time those who are prescribed psychiatric drugs over long periods of time, end up in a bad way. This begs the question, who is responsible for her untimely death? Who is responsible for the prescriptions of multiple, mind-bending, personality changing, multiple-side effect psychiatric anti-depressant drugs that she was prescribed? “…Dr Andrews conducted the toxicology tests and found Ms O’Riordan had a blood alcohol concentration of 330mg and urine alcohol concentration of 397mg. Traces of four medications used to treat depressive disorders were found in her system but all bar one was within the low therapeutic range. What were the four medications used to treat depressive disorders that she was prescibed? and why were her psychiatrists not monitoring her and her prescriptions? why was she left alone in such a state with access to multiple psychiatric medications? were the psychiatrists tracking her reactions to the meds she was prescribed over the years? One of Dolores’s psychiatrists was US psychiatrist Dr Robert Hirschfeld. When you google Hirschfeld, it’s interesting that the third link that comes up is from a blog from an ex-patient of his who seems not too happy with Hirschfeld’s apparent long links to psychiatric drug manufacturers. “….On the surface, Dr. Hirschfeld seems like an awesome doctor – and he very well may be. Dr Hirschfeld’s bio from the University of Texas Medical Branch at Galveston (UTMB) extols the “Professor and Chair” of its psychiatry deparment. He has history of working with various national organizations such as the National Depressive and Manic-Depressive Association, National Institute of Mental Health (NIMH), and National Alliance for Research on Schizophrenia and Depression (NARSAD). He’s written all kinds of articles and blah blah blah. He’s considered a leader in his research of bipolar disorder. Most people don’t realize that bio-psychiatrists, like the ones who treated Dolores, are not concerned with helping their patients deal with trauma of personal problems. They are fixated on the brain of the ‘mentally ill’ person and not their emotions, or feelings. They treat the brain, not the person. I didn’t realize this myself, until I came off psychiatric drugs some years ago, and researched psychiatry and the drugs industry. I was absolutely shocked and appalled when I realized that psychiatrists were beholden to the drugs industry and saw no problem with selling themselves to the industry to make money. I was shocked to see that drug companies have been hiding side effects for years with many of their drugs, and that many tens of thousands of people’s lives were being destroyed due to the over-medicalization of human distress. Ultimately, alcohol was deemed responsible for her untimely death, however it would seem to me that psychiatric drugs were a massive factor also. Anti-depressants don’t mix well with alcohol, I know this from personal experience, they also can make people crave alcohol sometimes, (to take the edge off). Of course- psychiatrists and the drug’s industry play down these side effects- they play down all side effects, because it’s in their interest to keep you, and everyone else, on these drugs. It’s not in your interest, it’s in theirs. Trauma = Psych Diagnoses = Psychiatric drug regime= lifetime of side effects= personality changes= polypharmacy= death. This system has to change, vulnerable people like Dolores deserve better. Was Ruth Davidson Prescribed Seroxat? There has been much discussion online about UK MP – Ruth Davidson’s – revelations that she had adverse reactions to an anti-depressant which she was prescribed in her young college years. The anti-depressant that caused her so many problems hasn’t been named, but it looks like it could have been Seroxat. In an excerpt Ruth describes the common side effects of Seroxat induced nightmares, paranoia, increased suicidal thoughts, and self harm (all now known and well established Seroxat side effects which are more common than GSK, psychiatrists, or the UK regulators will ever admit). In the excerpt, of Ruth’s story, below (from Sunday Times Magazine 16th Sept 2018), she mentions that the anti-depressant she was prescribed was embroiled in legal controversy including class action lawsuits in relation to suppression of info about adolescent suicide. The only drug that has had this major controversy discussed in the media is Seroxat/Paxil, so I take it that Ruth was likely prescribed Seroxat and that this is the drug that caused her so much misery. Davidson, who is pregnant with her first child, talked about going into “a total tailspin” after a boy she knew killed himself. At 17, she said that she started hurting herself, punching walls, cutting her stomach and arms with blades or broken glass. When she was 18, she was diagnosed with clinical depression. The comments were made in her new book, extracts of which were published in the Sunday Times. During an interview with the paper, Davidson pulled up her sleeve to reveal her scars. The Scottish politician’s openness and frankness has been met with praise by psychiatrists, politicians and mental health campaigners. Norman Lamb, the Liberal Democrat MP for North Norfolk, said she was an “admirable human being”, adding that her words would help to confront the stigma around mental health problems. Alastair Campbell, the former spin doctor who is now an ambassador for Time To Change, Mind and Rethink, said that Davidson’s decision to speak about her mental health could only be a positive thing. “The more people in public life who show that it is possible to have, or to have had mental health problems, and to take on big challenges, the better,” he said. The Royal College of Psychiatrists were equally positive, with Dr Bernadka Dubicka, chair of the Royal College of Psychiatrists’ child and adolescent faculty, saying it showed anyone can be affected by mental illness. “But with the right help, people can recover and lead successful lives,” she added. “That’s simply not true; mental illnesses, just like their physical counterparts can be managed and with the right support they don’t render a person less capable,” she said. Lamb said that the balance Davidson displayed showed exactly the sort of person who should be in the political the system and running the country. “We should reflect profoundly on how the way we do politics puts off someone like that,” he said. Lamb said in 2015 he had to make his own mind up on whether to stand as leader of the Lib Dems. “[I was] wracked by self-doubt and indecision and completely identify with what Davidson says and the view she reaches and the words she uses to express the fact she is having a child and wants to commit to that child as a parent,” he said. At 18 she was diagnosed with clinical depression, but her medication gave her “desperate, dark, terrible dreams” where she “couldn’t tell what was real”. “I started having suicidal thoughts,” she said. By her second year at university, Davidson “became so afraid of sleep that I spent a whole term living nocturnally”. She described depression as “a smothering black blanket” that took away her hope and energy. She added she was still scared of returning to that state. “When I have periods of heightened anxiety, or I can feel the weight of the black blanket start to descend, I go back to what I know works for me: structure, exercise, forward momentum, measurable outcomes. Sometimes that’s hard in a job that’s 100 miles per hour,” she wrote.